Please Put Up Wayne's Coat! No, not in your coat closet... on your walls! 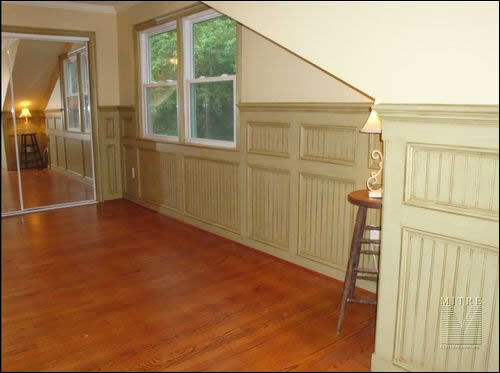 Sometimes misunderstood and spelled as "wayne's coat," wainscot refers to paneling on the lower portion of a wall. It is also correctly spelled as wainscott, wainscoting, and wainscotting... but is just as often misspelled or misprounounced as wainscoat, wainscoating, and the funniest... "wayne's coat." The term "wainscot" is thought to be derived from a Dutch word that originally referred to a superior quality of oak used for fine panel work, and has been used in the English language since the 16th century. 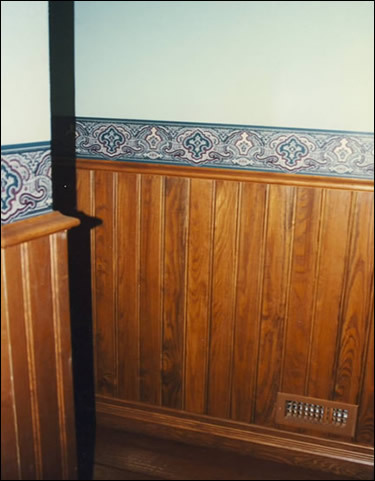 However, it wasn't until the 18th century that the style of paneling changed from full height to one that only covered the lower portion of the wall. The term then began to refer to this shorter paneling, and is still how we use the word today. 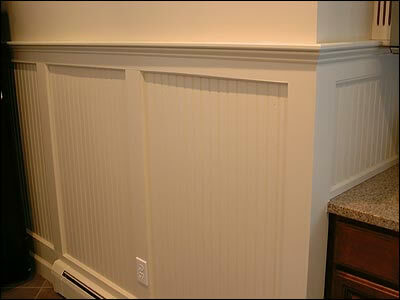 Here are some examples of Wainscot paneling, from simple applications to more detailed trimwork. This first one is Yellow Pine that has been stained. 1. Above, our 3-1/4" Yellow Pine Beadboard is installed wall-to-wall with 1" Nosing as a Cap and our Baseboard at the bottom. Installing the Baseboard in front of the Beadboard covers the gap between Beadboard and floor. If nails will be covered by the Cap Moulding and Baseboard, then simply nail at the top and bottom of each wainscot board. If wainscot is taller than 36" it is best to also nail through the tongue halfway along the height of the each board, as described at our installation page. In our June newsletter, we celebrated our thirty-fourth anniversary with a timeline of our first year. As promised last month, here's what happened next in the history of Vintage. We've just passed our first anniversary, and here comes another major milestone! We are moving from the small workshop on Gregory's rural property to an old building in downtown Quinlan, Texas. We're still growing fast and adding staff to meet demand. In fact, we've been growing so rapidly that each time an adjoining building becomes available we rent it and knock a hole through the wall! By the mid-80s, we have strung together all but two of the buildings on our side of Main Street. We're adding lots of new items and getting crowded once again... So, we are building our own facility on the edge of town. We've been happy here ever since! 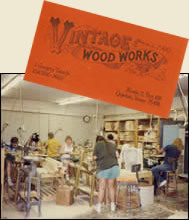 Each year, we add a few more products, thousands of new customers, and keep "Bringing Back Yesterday in Quality and Service." 2. This installation creates a very clean, finished panel effect by using a border around each section of Beadboard. This can be accomplished by "framing" our Beadboard with Plain Boards and a small moulding. Or, use our Cap #54-210 for the visual effect of even more depth. 3. In this kitchen, multiple panels were created on this wall by framing smaller sections of Beadboard. This one is kept simple with just a Plain Board frame, a Cap Moulding at the top, and a Baseboard at the bottom. Of course, more detail can be achieved by adding a Moulding to the inside edge of each "frame." 4. 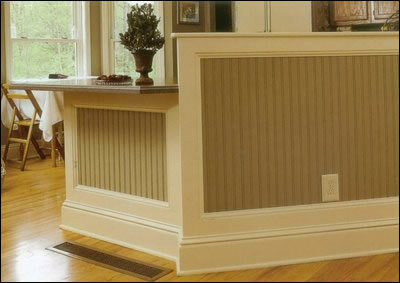 Like most interior trimwork, wainscot panels can become as elaborate as you desire! This installation boasts two rows of panels, stacked vertically, to create even more drama in this room. The same types of materials are needed but more panels are created. Don't forget... our Screen/Storm Doors are still on Sale!